sisu: "They wanted to believe"
"Dr. Seuss’s political cartoons from the early 1940s are just as dead-on target as when he first drew them, and especially pertinent today as the ideological heirs of the good Doctor’s 'Appeasement' characters run amok in the streets of Europe and San Francisco," wrote Charles Johnson of Little Green Footballs way back in March of 2004, cited in our own post "Clueless, then and now." The Bush Administration has gone on the offensive this week to shore up collapsing support for its policies in Iraq. The latest effort -- transparent as it is inaccurate -- tries to draw parallels between Iraq and World War II . . . In a long, looping analogy, Rumsfeld described the period before America entered World War II as a time "when those who warned about a coming crisis -- the rise of fascism and Nazism -- were ridiculed and ignored." He said critics of the Iraq war "seem not to have learned history's lessons." Meanwhile, in an almost uncanny echo of Rumsfeld's overblown rhetoric, anti-war groups mobilizing for a rally in Washington on Oct. 5 have themselves seized on Nazi analogies [doh] . . . It presents a bill of particulars, from the response to Hurricane Katrina to denying women abortion rights. "People look at all this and think of Hitler, and they are right to do so," the ad concludes. And, like Rumsfeld, the alliance warns that "history is full of examples of people passively hoping to wait it out, only to be swallowed up by a horror far beyond what they ever imagined." President George W. Bush has recast his global war on terror in recent days into a "war against Islamic fascism." Fascism, in fact, seems to be the new buzz word for Republicans in an election season dominated by an unpopular war in Iraq. Bush used the term this month, in talking about the arrests of suspected terrorists in Britain, and spoke of "Islamic fascists" in a later speech in the middle America state of Wisconsin. Spokesman Tony Snow has used variations on the phrase at White House press briefings. "The War is Coming. 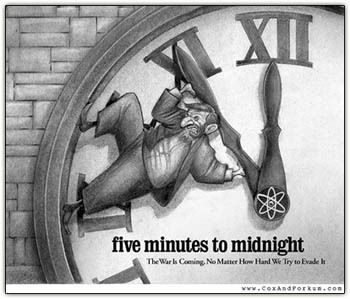 No Matter How Hard We Try to Evade It" subheads Cox & Forkum's awesome cover illustration for Robert Tracinski's "Five Minutes to Midnight." Observing the events of today -- the hesitation and uncertainty, the stubborn clinging to the fantasy that the enemy can be appeased if we just keep talking and find the right diplomatic solution --I now feel that, for the first time, I really understand the leaders of the 1930s. Their illusion that Hitler could be appeased has always seemed, in historical hindsight, to be such a willful evasion of the facts that I have never grasped how it was possible for those men to deceive themselves. But I can now see how they clung to their evasions because they could not imagine anything worse than a return to the mass slaughter of the First World War. They wanted to believe that something, anything could prevent a return to war. What they refused to imagine is that, in trying to avoid the horrors of the previous war, they were allowing Hitler to unleash the much greater horrors of a new war. Today's leaders and commentators have less excuse. The "horror" they are afraid of repeating is the insurgency we're fighting in Iraq—a war whose cost in lives, dollars, and resolve is among the smallest America has ever had to pay. And it takes no great feat of imagination to project how much more horrible the coming conflict will be if we wait on events long enough for Iran to arm itself with nuclear technology. Among the horrific consequences is the specter of a new Holocaust, courtesy of an Iranian nuclear bomb. Yes, but how would it play in a focus group? Gee, Sissy. I thought everybody knew "fascist" really means Republican. Where's everybody been? 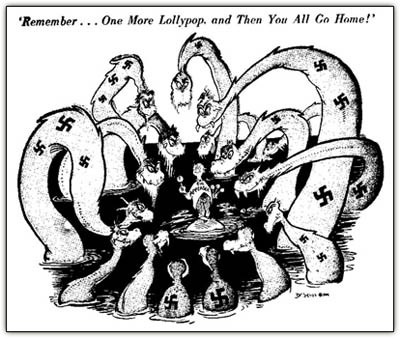 Ironic, Dr. Seuss was someone who could recognize the threat of the AXIS, but turned into a liberal appeaser facing the Soviet Union with sincere denial. his opposition to Ronald Reagan was overt, at times uncivil, and completely misguided, as the legend President Reagan led to the liberation of 100s of Millions in Eastern Europe. President Reagan was right, appeasement was indeed self destructive, and 'containment' was not good enough for our World. he understood fully, isolation was pure suicide, and the USA needed to lead in this dark world. It is quite appropriate, for the liberal MSM, to fail to understand the simple conjecture of the current Secretary of Defense for the USA in a time of War. You have laid bare the crisis. Has Western Civilization become too soft to face the true nature of human kind? In the relatively slow moving world of World War II there was time for a slow awakening and building a response that eliminated Hitler and his forces. Fanatical Muslims armed with Nuclear Bombs may allow us no such time. Wake up, you of faint heart, and face that it is a kill or be killed world today as it always has been and always will be when the power to rule falls into dictatorial hands be they religious or secular.